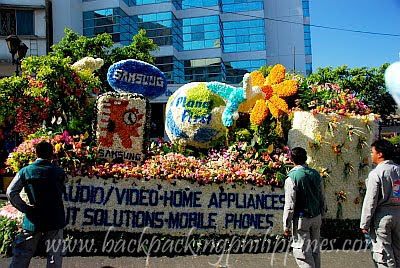 On its fifteenth year of staging colorful festivals, Baguio Panagbenga Festival, patterned after the New Years Day Rose Parade in Pasadena, is a festival of flower-covered floats and marching bands showcasing the colorful flowers of the Cordilleras. 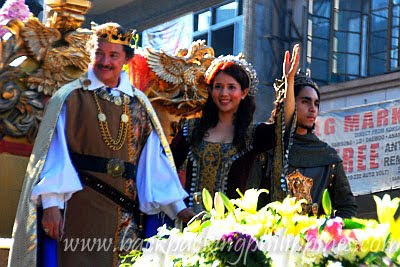 GMA 7 Kapuso Stars with Camelot-themed float. 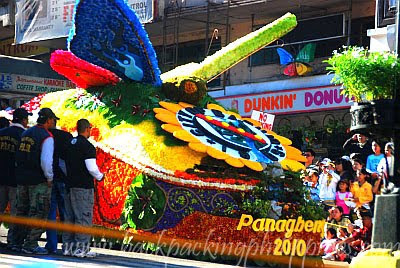 All in all, there were 24 floats showcased for Panagbenga 2010 (Tutubi can't remember how many were there in 2003, the first time he witnessed the event). The float parade started at around 8:20am and finished shortly before 10am. 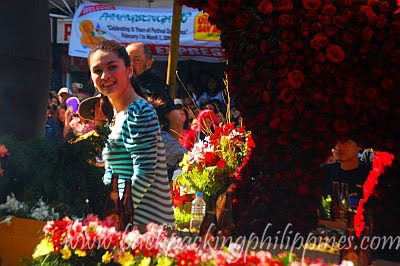 Tutubi's tip: try to be along the Panagbenga Festival parade route as early as 6am to get a "front row" seat on Session Road and other streets along the way. There are temporary stages/benches where you can seat but those get reserved very early. There really are too many people seeing the festival up close. If only festival organizers can lengthen the parade route to allow spectators to spread out instead of concentration on jam-packed Session Road (na di mahulugan ng karayom). If you're a photographer, try to secure special passes so you can walk in the middle of the road and get the best vantage points, instead of just trying your luck on the sidewalk. 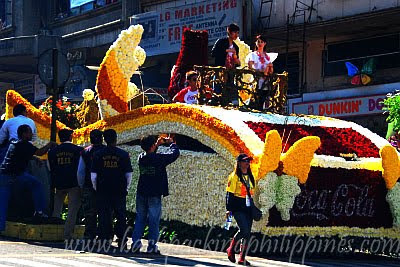 Lastly, book your bus trips and Baguio accommodations early particularly those near the Panagbenga parade route (maps available online if you want) so that you can easily walk or view the parade outside your hotel window. Tutubi has seen Panagbenga in an unplanned trip in 2003, this time however is not much different except he got free accommodations from an officemate and early bus tickets from Victory Liner. Personally, Tutubi prefers the "audience participation" style of Ati-atihan festival (Kalibo, Aklan), the authentic father of all Philippine festivals. 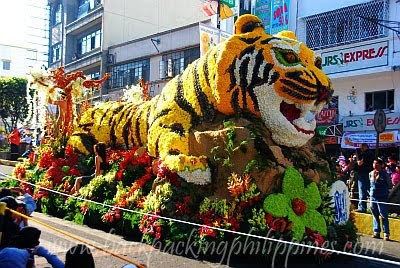 It seems Panagbenga festival is only about the flowers and showcasing less and less of genuine culture of the Cordilleras making the festival less authentic. When Tutubi was there in 2003 it was Ricky Martin's "Living La Vida Loca" played by the marching band instead of authentic music of the Cordillera people. The 2010 edition featured knights, princes and princesses that's so un-Cordillera, not even Filipino-- no wonder Philippine tourism is not that well-known due to misplaced preferences. nice. pumunta ka pala. daming artista. gusto ko ring makita to kahit minsan lang. Oh! Those floats are wonderful. I like these photos of yours. Thanks for sharing. These pictures are very nice indeed. Keep'em coming! Lovely, what a nice carnival! 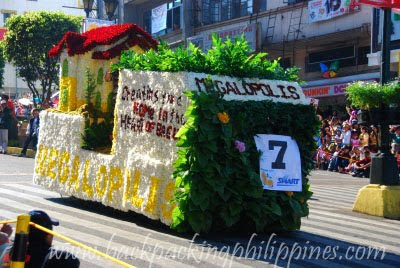 A very very interesting Panagbenga Festival .........i want to be apart of this festival.......how can i join it...........? very nice picture i want to go too! Sgen-CFDT : Apprentissage de la lecture : assez de polémiques, des réponses sérieuses ! That picture made ​​me want to be there. Thank you for this article. I travel to the Philippines next week. This article and the pictures make me already dreaming.